Mountain Riders, a French education association for sustainable development, has created the Flocon Vert label to raise awareness of tourists on the climate cause and promote sustainable tourism. The objective is to reconcile snow tourism and respect for the environment by encouraging skiers to turn to eco-responsible stations. 1. What is thel Flocon vert label? 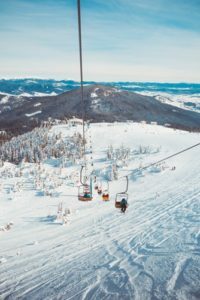 Since 2006, the Mountain Riders association was producing the Eco Guide for mountain stations from a questionnaire sent to various actors in mountain areas: local representatives, tourist offices and ski lifts. This initiative aimed to identify and promote good practices of stations in term of sustainable development. If the Eco Guide was used to highlight eco-friendly activities in the mountains, it did not however allow to choose a holiday destination thanks to clear environmental criteria. Therefore, the association launched in 2011 the Flocon Vert label, after having established the eligibility criteria with 70 structures experts in sustainable tourism in mountain areas. The Flocon Vert label joins the international Green Globe label, which lists tourism initiatives in line with the UN Sustainable Development Goals. The Mountain Riders’ initiative is also supported, since its creation in 2011, by the Auvergne-Rhône-Alpes region, one of Euromontana’s member, and by the Provence-Alpes-Côte d’Azur region. 2. What are the Flocon vert label criteria? This distribution helps to take into account all the range of actors concerned by sustainable mountain management. Therefore, the association does not only target ski stations managers but also tourist offices and local representatives. Green transports (public transport, carpooling). 3. How does the labelling process work? All mountaineous tourist destinations are concerned: mountain stations and mountain tourist villages can apply to the label. The questionnaire includes 128 questions, to be answered by the main actors of the station: the mayor, the tourist office and the ski area’s manager. This is followed by an audit to verify the station’s commitment to sustainable development and tourism. It is carried out by an independent sworn organization charged with verifying the respect of the specifications of the label’s requirements. A labelling committee then decides on the attribution of the label to the station for a 3 years period. This committee includes various organizations promoting sustainable development, sustainable tourism and mountain tourism, such as: The Foundation for Nature and Human, The Environment and Energy Control Agency, Savoie Mont Blanc University, Terre Agir Foundation, Sustainable Tourism Actors (ATD) and Mountain Riders. Once obtained, the label benefits to the entire station, ski lifts and the local tourist office. What is the label’s price? Flocon Vert label is a paid label. Its price is however set on a case by case basis according to the attractiveness and the size of the station, it can thus vary between 4.000 and 10.000 euros for the first year. In addition, this rate is decreasing. The first year of certification concentrates most of the costs, particularly related to administrative procedures and the audit process, while these costs decrease in the following years. 4. How can the label participate in the preservation and attractiveness of mountain areas? The benefits of the Flocon Vert label for mountain areas are numerous, thanks to the wide scope of its criteria, and have consequences on the daily life of tourists, inhabitants and workers of those territories. Initiatives of these labelled stations help preserving the natural heritage of mountain areas by focusing on the sustainable management of energy, natural resources, transport and waste. Awareness-rising actions for residents, tourists and professionals are also a keystone in all labelled stations. Each of them respects the 21 criteria of the label and has established its strategy according to the priority needs of its region. Transport is one of the priorities for these areas in order to guarantee accessibility and sustainability. The Pierre Saint-Martin has opted for the implementation of a Skibus to reach the station by public transport, an initiative that attracted more than 4,400 people in 2015. An interesting initiative when the we know that a full bus emits half the CO2 amount compared to a car carrying two people. The station has also set up an internal bus dedicated to employees, which connects the valley to the station. Similarly, in 2005, the Community of Communes of the Chamonix-Mont-Blanc Valley set up the free movement of transport for inhabitants and visitors, who can move freely on all bus lines and train lines between Servoz and Vallorcine. These transports allow access to the main points of interest such as the different ski areas. On-demand transport service for isolated hamlets and people in need also exist. Same thing in Valberg, where the Departmental Council of the Alpes Maritimes made the choice of a public transport developed in winter as in Summer with the 100% snow bus and the Hiking bus. The snow cover management is obviously a criterion for the sustainability of these stations. La Pierre Saint-Martin has implemented various measures to reduce the environmental impact of the ski area management, such as drivers training in eco-driving or the optimization of grooming circuits. Others, such as the Chambrousse station, have also chosen to equip in 2017 the 300 m² roof space of the station with photovoltaic panels, thus benefiting from the high brightness of the mountain tops to produce a greener and cheaper energy. Interested by the Flocon vert label? Find more information to apply on the applicant page. You can also read Euromontana’s view on sustainable tourism in mountain areas as well as all our work on this topic here. Download this good practice in a PDF file!